Resguardo is one of three preaching points that the church in Charalá is engaged in currently; there are thirty-two areas around the town that are in need of evangelizing, preaching points, and churches. 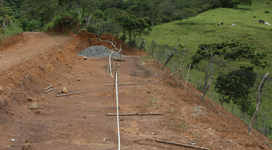 Two pieces of land have been donated to the main church; one will host the church and the other a small leader retreat center. An attendee of the preaching point in Resguardo generously donated one of the pieces to build a church on; this land is at the top of a mountain, and the sight is incredible. This is the photo above. We are still in need of teams and finances in order to complete the project. Depending on the value of the dollar, it would be posisble to complete the project for approximately $20,000.